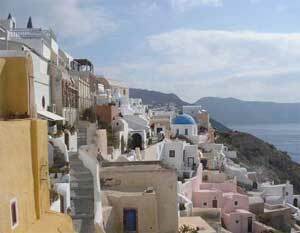 Oia is the first preserved traditional settlement of Greece, with features houses built (dug in the rock). Thousands of visitors from Greece and around the world arrive every summer in Oia to enjoy the unique beauty and breathtaking views of the caldera in the games of colours. It is worth visiting the Naval Museum and the traditional settlement of Phoenicians, who is just 1.5 km Swim in the two bays Ammoudi (by road or by climbing down 214 steps) and Armenia (the only access is some 300 steps) or Baxedes and Kouloumpos beaches, are only about 3 km and located on the outer side of the island. The village of Oia is ideal for relaxing holidays. The picturesque streets you will find many stores for shopping, sumptuous restaurants and cafes, all with unique sea views and quiet bar. You can stay in traditional cave and newly built apartments that have followed the line of rock and offering idyllic accommodation and spectacular views.